Despite a trebling of the global commercial shipping fleet in the 100 years since the sinking of the Titanic, overall shipping loss rates declined from one ship per 100 per year in 1912 to one ship per 670 per year in 2009. This telling statistic comes in a new report from specialist marine insurer Allianz Global Corporate & Specialty (AGCS). The report reveals that while marine safety has vastly improved in the century since the Titanic, the maritime industry now faces new risks driven by the continued growth in world shipping. Human error risks and the growing trend to super size ships are among the next challenges facing the industry, AGCS says. Human error is described as the weakest link in the system. Over 75 percent of marine losses can be attributed to a wide range of human error factors, including fatigue, inadequate risk management and competitive pressures, as well as potential deficiencies in training and crewing levels. Other significant safety risks include: increasing bureaucracy on board ships; the continued threat of piracy off Somalia and elsewhere; and the emergence of ice shipping and its associated navigational and environmental complications. Still, shipping disasters tend to spur marine safety improvements and Costa Concordia is certain to be no different, the report says. Marine transport is one of the safest means of passenger transport overall with far lower fatal accident rates than car, motorcycle, bicycle or walking in Europe. Check out I.I.I. facts and statistics on marine accidents. Ahead of the National Hurricane Conference in Orlando next week, Colorado State UniversityÃ¢â‚¬â„¢s Tropical Meteorology Project has issued a brief update of the atmospheric/oceanic conditions likely to impact the 2012 Atlantic hurricane season. Despite its forecast for lower activity, the CSU team stresses that there is inherent uncertainty in seasonal tropical cyclone (TC) prediction and that hurricanes can make landfall in inactive seasons and do major damage (e.g. Hurricane Alicia in 1983 and Andrew in 1992). – A 45 percent chance that the THC continues in the above-average condition it has been in since 1995 and a significant El NiÃƒ ±o develops resulting in a seasonal average net tropical cyclone (NTC) activity of 85, suggesting 8-11 named storms, 4-6 hurricanes, 1-2 major hurricanes. – A 25 percent chance of a continuing above-average THC and no El NiÃƒ ±o develops, resulting in NTC activity of 130, with 12-15 named storms, 6-9 hurricanes, 3-4 major hurricanes. – A 25 percent chance that the THC becomes weaker and a significant El NiÃƒ ±o develops, resulting in NTC activity of 50, with 5-7 named storms, 2-4 hurricanes, 0-1 major hurricanes. – A 5 percent chance that THC becomes unusually strong in 2012 and no El NiÃƒ ±o develops resulting in NTC activity of 180, with 14-17 named storms, 9-11 hurricanes, 4-5 major hurricanes. AÃ‚ full discussion of the CSU team’s 2012 Atlantic basin hurricane forecast will follow on April 4. Meanwhile, check out I.I.I. facts and statistics on hurricanes. The magnitude 7.4 earthquake that hit Mexico yesterday may not have resulted in any tsunamis for the U.S., but this does not diminish the tsunami threat. Major tsunamis are produced by large earthquakes (greater than magnitude 7 on the Richter scale) and those with shallow focus (<30km depth), according to NOAA. Since 1850 tsunamis have been responsible for the loss of over 420,000 lives and billions of dollars of damage to coastal structures and habitats, NOAA says. Most of these casualties were caused by local tsunamis that occur about once per year somewhere in the world. Tsunamis also result from distant earthquakes. Last yearÃ¢â‚¬â„¢s magnitude 9.0 Japan earthquake and the 2010 Chile earthquake caused tsunami strikes in Hawaii, Alaska, Washington, Oregon, and California, for example. Next week is National Tsunami Preparedness Week, so now is a good time to remind ourselves of the risk and what to do if a tsunami happens. By the way, catastrophe modeler EQECAT estimates that yesterdayÃ¢â‚¬â„¢s Mexico quake will result in insured losses of less than $100 million. Check out this I.I.I. release for more information on earthquake insurance Mexico and a chart of the most costly world earthquake/tsunamis. Tomorrow marks the official start of spring and typically the arrival of flood season as the snow melts. However, given the unseasonably warm temperatures in many parts of the country, you could be forgiven for thinking that spring had already sprung. Largely due to the limited winter snowfall, this year for the first time in four years, no area of the country faces a high risk of major to record spring flooding, according to NOAAÃ¢â‚¬â„¢s annual Spring Outlook. The Ohio River basin including portions of Illinois, Indiana, and Kentucky, along with parts of Louisiana and Mississippi are the only areas with an above-normal risk of flooding as soil moisture and river levels are currently above normal. Additionally, odds favor above-average April rainfall for the Ohio River basin. However, the mild winter does not entirely eliminate the risk of spring flooding. In other words, donÃ¢â‚¬â„¢t put your umbrella away and donÃ¢â‚¬â„¢t let your flood insurance policy lapse. The top 10 most costly flood events in U.S. history are associated with hurricanes and tropical storms, according to facts and statistics from the Insurance Information Institute (I.I.I.). Still, a 2011 I.I.I. poll found that just 14 percent of American homeowners had a flood insurance policy, below the 17 percent who said they purchased flood insurance in 2008. Pictures often speak louder than words and this is most certainly the case as we look at a recent history ofÃ‚ commercial lines insuranceÃ‚ price changes. The chart, from Towers Watson’s most recent Commercial Lines Insurance Pricing Survey (CLIPS),Ã‚ compares the change in prices charged on policies underwritten in the most recent quarter to those charged for the same coverage during the same quarter the prior year. 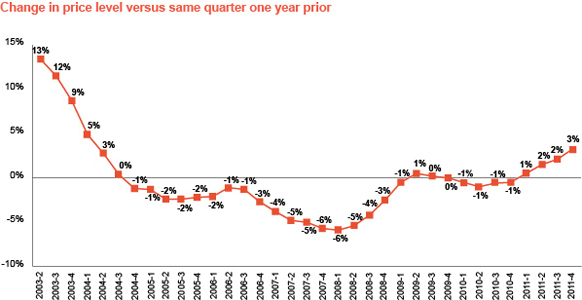 As we can see, Towers Watson’s survey shows that commercial insurance prices increased an aggregate 3% in the fourth quarter of 2011 Ã¢â‚¬“ the fourth consecutive quarter during which prices for allÃ‚ standard commercial lines rose. Once again, prices for workers compensation and commercial property showed the largest quarterly increases followed closely by general/products liability. Prices for directors & officers liability finally showed signs of stabilizing, Towers Watson said. Survey data were contributed by 41 participating insurance companies representing approximately 20% of the U.S. commercial insurance market (excluding state workers compensation funds). CLIPS data confirms the ongoing upward trend in commercial insurance rates observed by other surveys. By the way, the latest edition of Cavalcade of Risk, which features relevant and timely blog posts on a variety of risk management and insurance topics, is hosted by our friends over at Risk Management Monitor, and includes a link to our most recentÃ‚ post on MarketScout’s latest commercial pricing analysis. The composite rate for U.S. commercial lines was up 2 percent in February 2012, according to the latest analysis fromÃ‚ online insurance exchange MarketScout. Commercial property and workers’ compensation continued to lead the increases at plus 3 percent, followed by BOP, general liability and umbrella/excess with reported rate increases of 2 percent. All other coverages were up 1 percent, except for fiduciary and surety which wereÃ‚ flat. An articleÃ‚ on PC360 takes a closer look at the gradual incline in commercial rates. Damage assessments have begun in the wake of FridayÃ¢â‚¬â„¢s powerful storm system that brought a massive outbreak of tornadoes across the Midwest and South and left 39 dead. So far, the National Weather Service (NWS) has confirmed 42 tornadoes from Friday: Indiana Ã¢â‚¬“ 3; Virginia Ã¢â‚¬“ 1; North Carolina Ã¢â‚¬“ 2; Ohio Ã¢â‚¬“ 5; West Virginia Ã¢â‚¬“ 2; Kentucky Ã¢â‚¬“ 8; Tennessee Ã¢â‚¬“ 8; Alabama Ã¢â‚¬“ 7; Mississippi Ã¢â‚¬“ 1; Georgia Ã¢â‚¬“ 5. However, this number will rise as NOAAÃ¢â‚¬â„¢s Storm Prediction Center (SPC) logged 107 preliminary tornado reports from Friday’s outbreak, according to Dr. Jeff Masters’ Wunderblog. Dr. Masters notes that these preliminary reports are typically over counted by 15 percent and predicts the total number of tornadoes from FridayÃ¢â‚¬â„¢s outbreak will probably finish in the 90 to 100 range. The severe weather also brought damaging winds and hail. FridayÃ¢â‚¬â„¢s outbreak follows a separate storm system earlier in the week that spawned several tornadoes in the Midwest. The severe weather 28/29 February caused widespread property damage and left at least 12 dead. NOAA issued 440 tornado warnings and 606 thunderstorm warnings last week alone. USA Today has an interesting article on how tornado forecasts saved countless lives. The Insurance Information InstituteÃ¢â‚¬â„¢s facts and statistics are a useful resource on the insurance implications of tornadoes. Latest information can also be found at Guy CarpenterÃ¢â‚¬â„¢s online CAT-i bulletins and catastrophe modeling firm EQECATÃ¢â‚¬â„¢s CatWatch catastrophe reports.